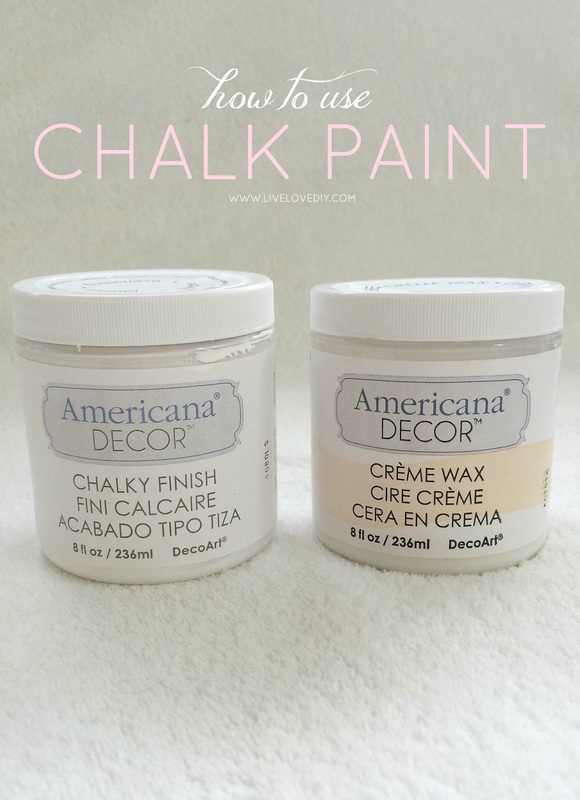 LiveLoveDIY: How To Paint Furniture with Chalk Paint (and how to survive a DIY disaster). How To Paint Furniture with Chalk Paint (and how to survive a DIY disaster). Hey ya'll. 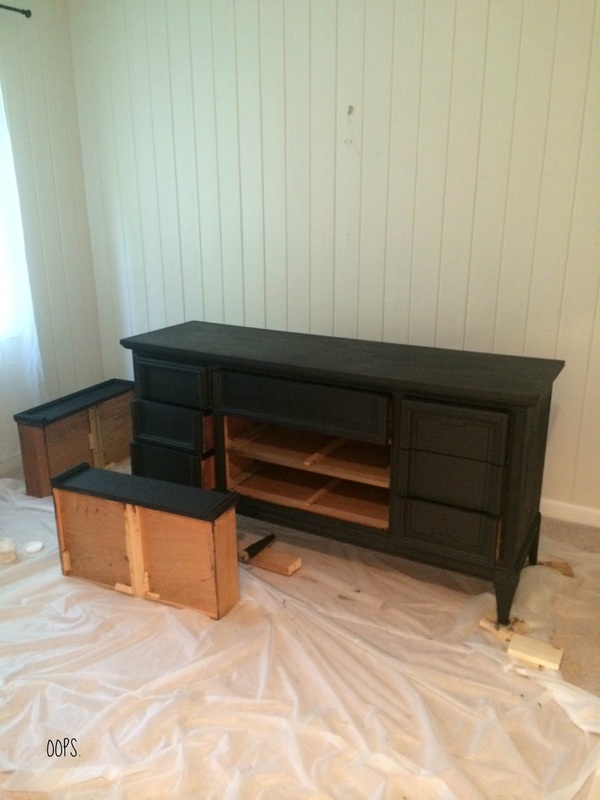 So remember the $50 Craigslist dresser I found last month for my TV stand project? And remember how I said I was going to stain it? Well, my first attempt at staining a dresser was a total fail. I spent two weeks on this thing, stripping it, staining it, hating it, painting it three different colors, and ultimately saving the day with some new chalk paint. Welcome to the latest episode of disaster blog. So, I've thought of a million ways to tell this story, most of which involve me leaving out 99% of it, but ultimately I've decided just to tell you everything. I'm sticking my toe in the vulnerability pool. Don't let me sink. I forgot my floaties back at the hotel. Let's rewind to the beginning. I've been working on assembling our living room, and finding the right sized dresser for the TV has been the hardest part. I'm usually limited in the budget department, so I've always had to try and make the best of what I already own. When we first moved in, we had a very old TV and an antique dresser (that will eventually end up in the entryway nook). It was the hottest of messes, and oddly enough, I still look back upon that time period as a great one. Then, Kevin was introduced. It was the worst thrift store dresser ever, and no matter how hard I tried...it just didn't work. So, during the 3 month period that I was living at Panera and the floors were being installed, I spent a lot of time searching thrift stores and Craigslist for something better. And I eventually found exactly what I needed on Craigslist for $50. Here's the original Craigslist picture. I was only interested in the shape and dimensions, and was willing to look past the orange wood color. So, Jesse hauled it home and I set it up in that little extra room back in the bedroom. Because although it makes zero sense, I emptied out that room and have been using it as my project room lately. So, this is where the story gets kinda odd. My original plan was to strip the dresser and use a combination of walnut stain and white wash to create a Restoration Hardware look. I did tons of research, and was just sure that I could pull it off. I succeeded in stripping the dresser.....and then totally failed with the staining. I didn't realize until AFTER I stripped it that the tops and sides of the dresser were some sort of pressed wood veneer, and no matter how hard I tried (even using several different products), the pressed wood just wouldn't absorb the stain correctly. Although the staining process was a total flop, the stripping process was a success. 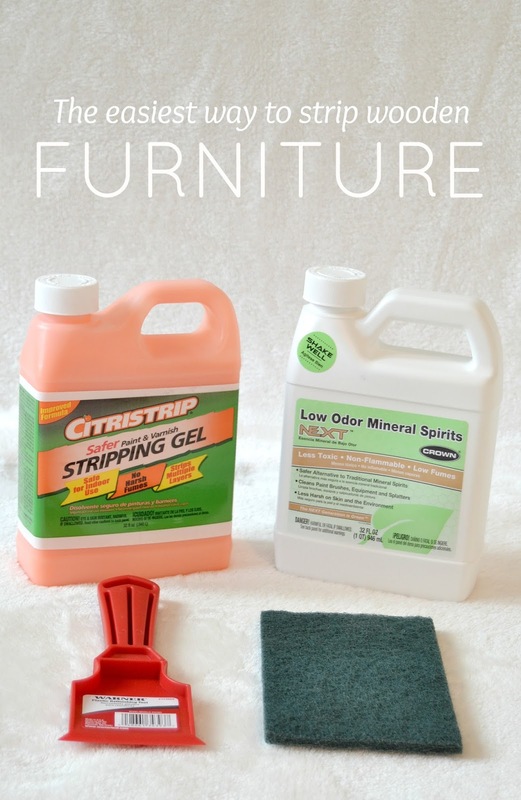 And since I get so many questions about stripping furniture, I thought it might be helpful to include a little bit about my first experience. First of all, I chose to use Citristrip stripping gel and mineral spirits because they barely smell and you can use them safely indoors (even though you'll still want to open a window). The only other supplies I needed was a plastic drop cloth (to catch all of the gunk that I scraped off), a plastic scraping tool, some scouring pads, some rubber gloves (made for stripping furniture) and some mineral spirits. I took all of the drawers out of the dresser, poured some Citristrip in a metal bucket (that you can get for $2 at Home Depot) and just used a paintbrush to apply the gel to the surface of the drawers and the frame of the dresser. I let the gel sit for about 30 minutes, and once I saw it bubble up, I started scraping off the residue with my plastic scraper. I was totally amazed at how easily it came off. It was weirdly cathartic to scrape off layers of gunk. 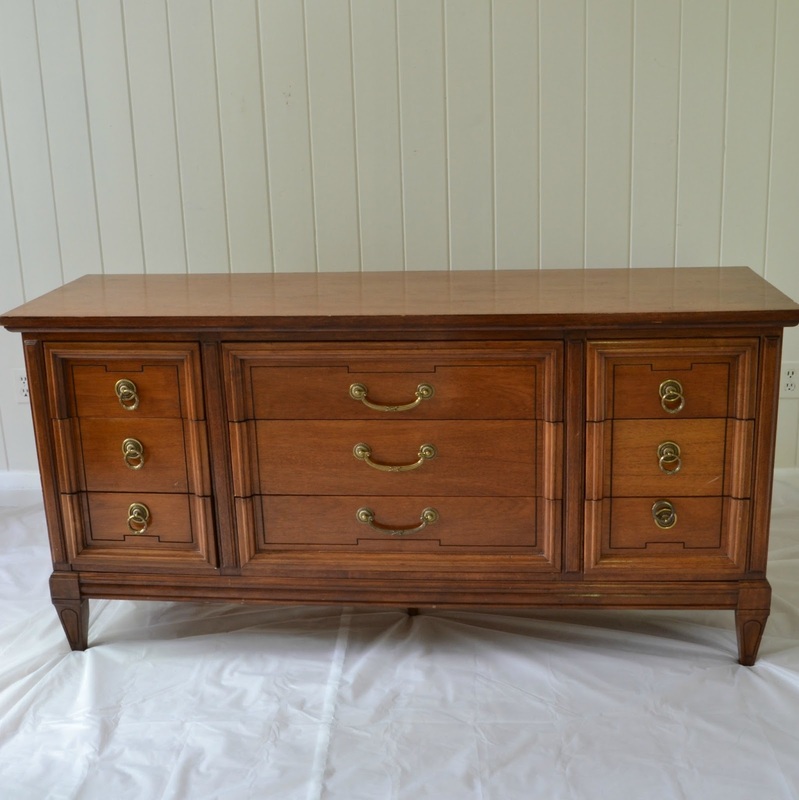 It easily removed all of the polyurethane and even most of the stain that was heavily applied to this 50 year old dresser. Because this dresser had a bunch of grooves and difficult areas, I then used a scouring pad (and an old toothbrush) to remove the rest of the residue. After that, I wiped the entire dresser down with mineral spirits (to remove any of the leftover chemicals) and then lightly sanded the entire thing with 320 grit sandpaper. And that's when I added wood conditioner and then tried to stain just the top, but when it wouldn't take, I just quickly stripped it back down. And then I realized that it wasn't a total loss, as raw wood surfaces are ideal for paint. Cup half full, ya'll. So, anyways, as I was wandering around the paint department at Home Depot trying to pick a color for the dresser, I came across some new chalk paint. 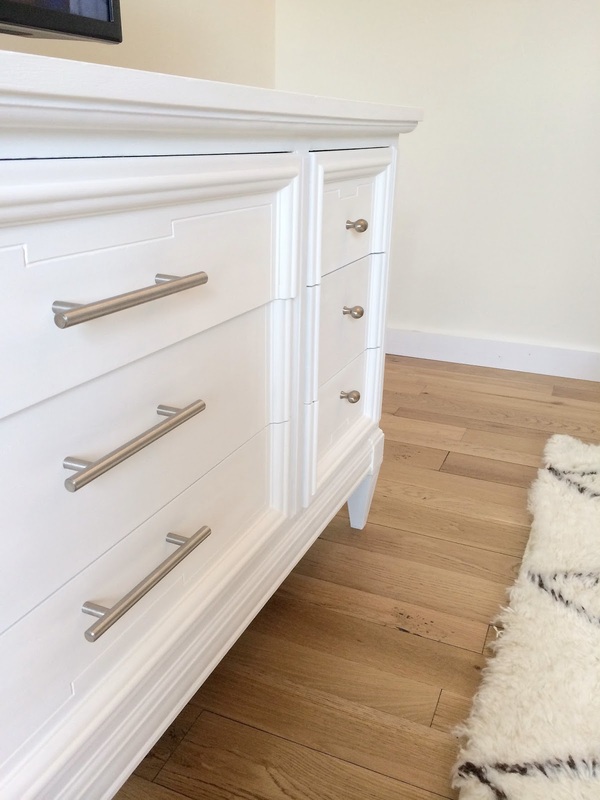 I've painted tons of furniture with chalk paint (including my favorite dresser), but I've always made my own with plaster of paris (recipe found here in tip #6). So, when I came across this stuff at Home Depot, I was curious enough to try it out. And, boy did I ever. So, I spent 3 hours painting the dresser black. It seemed like a really great idea at the time. But, it definitely was not. It ended up looking like a big chalkboard, and I just wasn't feeling it for the living room. So, then, I tried to paint the dresser using the tan color. And I moved my workspace out into the actual living room so that I could have a better idea of what it would look like in there. 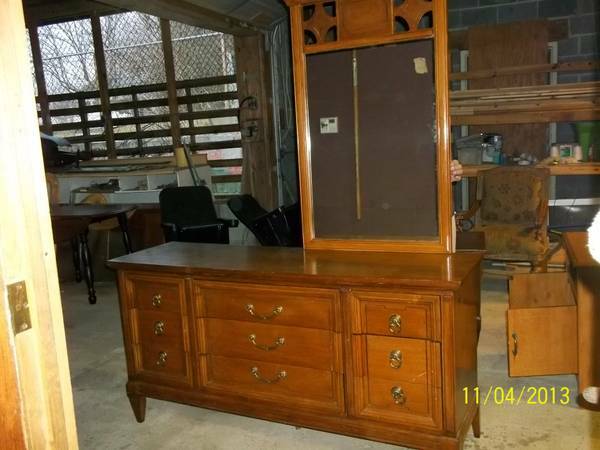 In all honesty, I thought the dresser looked okay in this color, but there were certain times of the day when it looked like a big purple blob against the living room wall. I also tried spray painting the original hardware with oil rubbed bronze like I used here, and it just made it look kinda bulky and outdated. And as you can probably imagine, at this point, I wanted nothing more than to throw a dresser bonfire party. And invite all the people. Finally, I decided to try one more time. For the win. 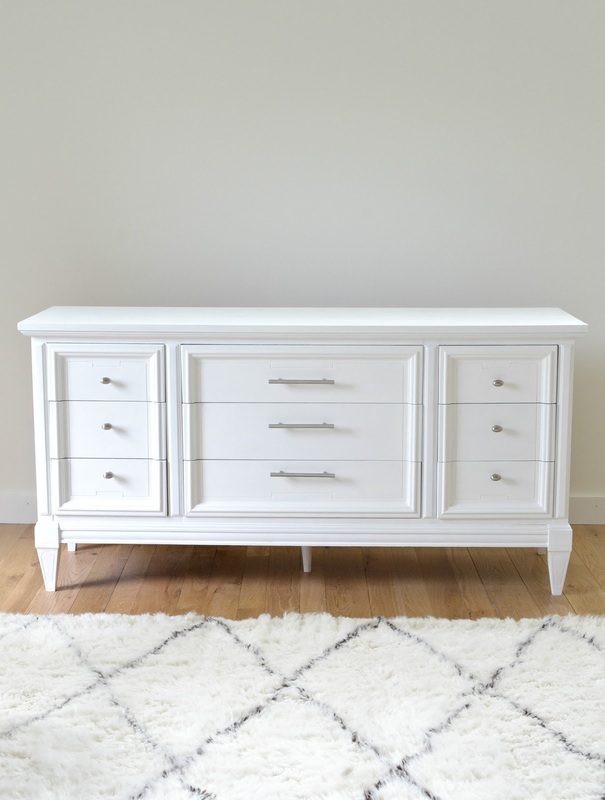 Now, I know painting a piece of furniture white isn't exactly groundbreaking territory, but I looked through a bunch of inspiration pictures and found quite a few white dressers that left me feeling hopeful. I painted it one more time...white. And then I waxed it, added some modern hardware, and finally....REJOICE. Insert tears and delirious laughter. So, just really quickly, here's what I ultimately ended up using. I used one little jar of the white Americana Chalk Paint named 'Everlasting'. (*Update: You can also find it online at Home Depot here.) The best part about this stuff is that you don't have to prime or strip the furniture or even sand it. You can paint over anything and it will adhere like glue. Obviously, I took a really weird route that involved stripping a dresser and painting it several times. But, let me repeat: All you have to do with this stuff is paint it straight on any piece of furniture, even if it has a glossy topcoat. You can also paint over a piece that's already been painted, and it still works. I know. I tested that theory thrice. And for the finish, I chose to use the Creme Wax. All you do is rub it on with a lint-free cloth, let it dry, then buff it to the desired shine. A wax finish is truly one of my favorites, and it looks so professional and smooth. I really liked the Americana wax, and I'll definitely use it again. Also, one little $9 jar of wax went really far. I used less than 1/3 of it on the entire dresser. And I was able to paint the entire dresser with one jar of paint. 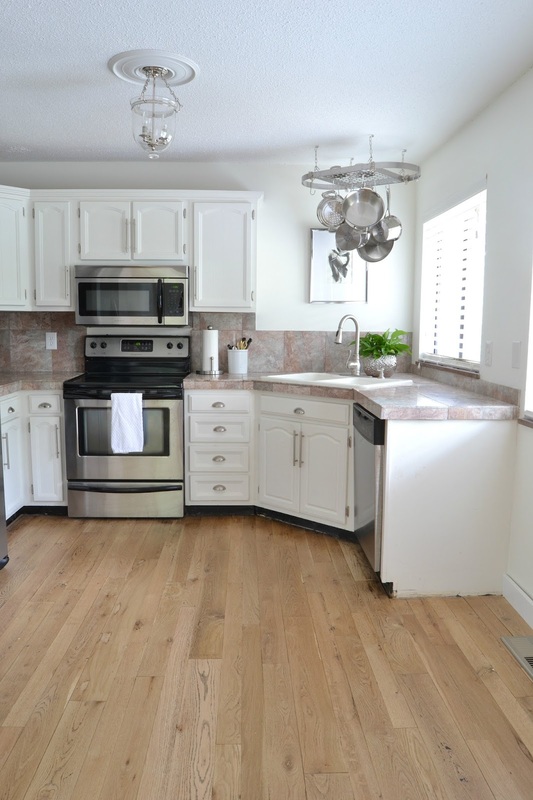 For the hardware, I decided to mirror our kitchen cabinet hardware, and it totally kinda tied everything together in the main living area. And also, since the dresser was really old and basically infused with the smell of 1960's cigarettes, I vacuumed out the drawers, and then painted the interiors and exteriors of each drawers with some Kilz primer (to trap the smoke smell) and then I used our leftover wall paint to coat the drawers. (You may remember when I did this a couple years ago with green paint.) It ended up being kinda cute....white on the outside with a little pop of grayish off white on the inside. In summary, now the dresser feels brand new, and I would like to erase the past two weeks from my brain. 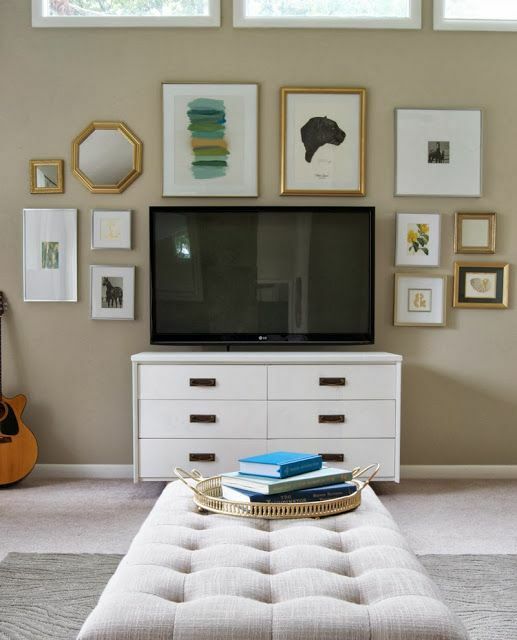 And although the jumbotron is still back in the bedroom (where we've been living), I ventured out into the living room for the first time since February, set up the tiny TV, and slothed all day with a newly released season of a very addictive Netflix show. And although this dresser project was a total nightmare, I'm so happy that I kept trying until I got it right. I truly do learn the most from trying new things, and all of the mistakes made along the way are usually the best teachers. And if you had tried to tell me that while I was in the pit of dresser despair, I probably would have used some adult words. I'll be back soon to share the living room (I'm so excited!! ), and I can finally share all of the lighting we chose for the main area! 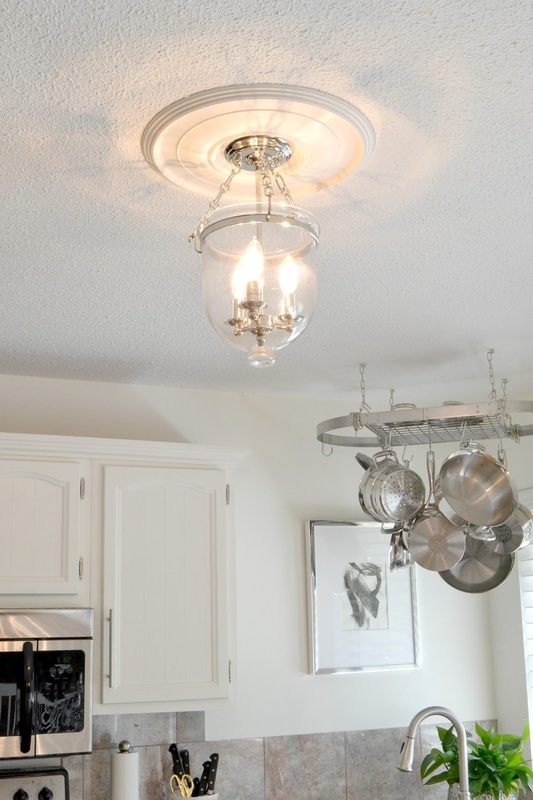 And before I go, here's a little sneak peek of the new kitchen lighting that I'm totally in love with. I finally took down the old Craigslist chandelier and installed the Hudson Valley Hampton semi-flush mount light in polished nickel, generously provided to us by National Builder Supply. I added a little ceiling medallion underneath, and I just love the way it looks when it's all lit up. 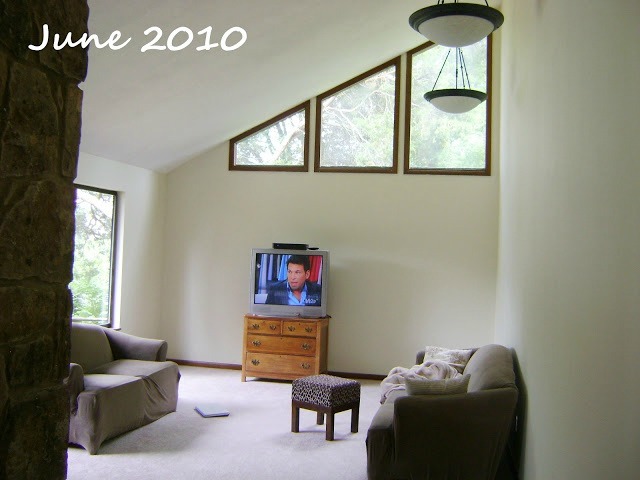 It never ceases to amaze me how a great light fixture can totally transform an entire room. My little kitchen feels so grown up. Oh, and also, I used some leftover door paint to make some black and white art that I framed over the sink. It's basically a scribble, but it seemed to work, so yay. And that, ya'll, is finally all. I'll be back in a week or two with the dining room reveal. P.S. Thank you for making it all the way through another long and awkward post. 10 points for being a soulsister. To check out more furniture painting advice, you can check out my top 5 furniture painting FAQS here.